...and not just for scrapbookers! This Scrapbooking software programme is so easy to use and will help you to make some truly stunning cards. 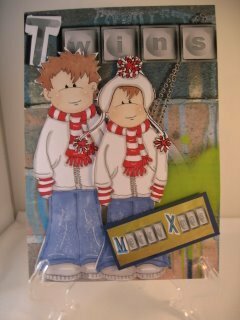 You will also be able to create your own backing papers that make you stand out from the crowd. 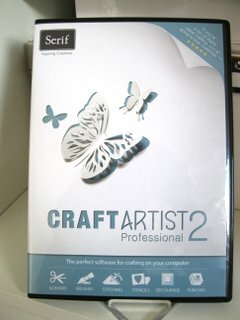 Let me introduce you to "Digital Scrapbook Artist 2" (DSA2) from Serif. Serif are a UK based company and they are bringing out new products and tools for the software all the time. This fabulous piece of software can give you some excellent results, and you don't have to be into scrapbooking to enjoy it. Cardmakers are all learning to love what this can do for them. It is very easy to use, just insert the disc and away you go. It is downloaded to your PC and from then on just click the icon, on your desktop, to access the software any time you want. You can produce your very own toppers and labels, as well as backing papers, and ideas for layouts to your cards, and so much more. Save what you create and make your very own Digikits which you can use over and over again and share with others too. On this Daisytrail disc there are five scrapbook layouts to start you off. But there are many others discs for you to choose from and they all have several Digikits on one disc ... covering many themes and occasions. You can also access Daisytrail where you will find lots more layouts for you to download ... for FREE ..... I love free stuff!! This is a community where you can upload your pages, chat to friends that you will make, and join the forums for discussions with like minded people. And any qusetions that you have will be answered quickly by a very friendly group. This card was made from a DSA2 background paper, and the writing was added at the same time. The characters are a digital download and the link to the website is in Resources. Altogether a very friendly piece of software, in more ways than one. Have fun playing with all the different new tools that are available on this new Craft Artist 2 Professional and it will integrate all your other Scrapbooking Software into it ... so none of your work is lost. There are tutorials to help you with every aspect of using this software from adding in textures to creating your oen brushes. Nothing is too much trouble and you will get all the help you need so that you can get the most from your purchase. Oh No! ... this is a massive software programme and once you try it you will be amazed a what it can do and it is much more simple to use than some of the more expensive programmes that are around.